I loved how bright this dish was in both flavor and presentation. I used a salad recipe from Epicurious and combined that with a shrimp marinade from Bobby Flay. Together, it made for a wonderful and refreshing dish. If you want a little more kick of heat, add a chopped serrano in place of the jalapeno pepper! Combine all the marinade ingredients in a bowl with the shrimp and toss to coat. Saute the shrimp in a skillet with 1 tablespoon of oil and cook until opaque. Remove from pan and transfer to a plate to cool. Meanwhile, place all the remaining salad ingredients but the salt in a large bowl. Stir to combine. Season with the salt and serve. Fresh and delicious!! 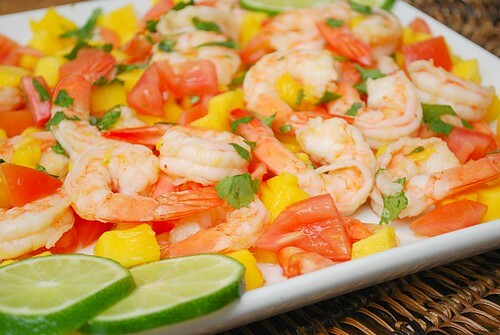 I love shrimp and I love mango, but never tasted them together. I must try them!! Aaaaaand my mouth is watering. I never would have thought to combine Jalepenos and Mangos but I certainly will now. I want to eat the screen!